If you have seen our DVD documentary "Mission Road: the Journey Back" - in which we perform mission era music in 7 of California's beautiful missions- you saw them baking hot and sundrenched and surrounded by gorgeous flowers. We perform often in the Missions and we get to see them in all their seasons. While we know life was not at all easy in the mission period even in good weather, we can imagine how hard it must have been in the winter. 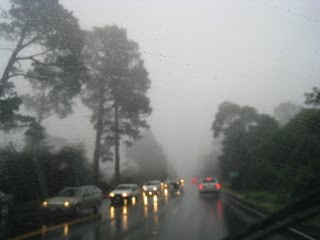 We drove south 125 miles to Carmel in increasingly heavy rain and fog, to find the mission under dark and moody skies. Not long after warmup started a magnificent rainbow seemed to take in the whole Monterey Peninsula. Intermittent rain in Carmel challenges our staff, who must set up the will-call table and the CD table out in the courtyard, man them during the two concerts, and move them quickly in case of a downpour.